Being that our house is on the market right now I have learned so much about real estate, buyers, sellers and the whole housing market in general. I knew that eventually we would have to find a bigger home, I was just unsure of when that would take place. Deep down, I always hoped that it would be later rather than sooner. Thank goodness, we have been in this house for a little over 6 years now and have loved being here so much. Now, as we look to move on we are sometimes overwhelmed with the housing choices that are available today. 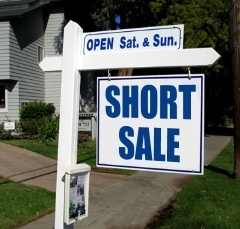 In thinking about purchasing a home, I have been researching the idea of a short sale. A short sale is basically when a lien holder agrees to accept less than what is owed on the house...thereby releasing the lien when the property is sold. To me, I think this would be a great way to go because typically, short sale properties are bank-owned and you won't be stuck with additional fees that the previous owner failed to pay. The house that we currently own was a bank-owned foreclosure. I think the process to get the house was a bit more complicated for us because the roof needed to be completely torn off and replaced and the bank that was holding the property was being picky about how the payment was to be made. We ended up paying cash and have a private mortgage. One thing you need to make sure of is that you have a good lawyer involved in the whole process so you are sure everything is done legally. When you have a Schwartz Sale you can work with a group of lawyers who specialize in short sales (among other real estate services)...which is great! In our search for a new home we have not looked at any short sale properties as of yet. Sometimes, there aren't very many around us either so we really would not know about them. However, I feel confident that if we were to find one, I know enough about short sales to understand how the process would work. This is a sponsored post for Schwartz Law Firm, however, all the points and views are my own.